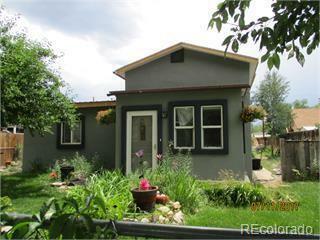 Live and work in this comfortable family home just 6 blocks from downtown Salida and Arkansas River access. Cozy, historic, Salida home with a new addition of a large family room and Master bed and bath with a balcony for taking in the great views. Wood stove keeps the gas bill down and warms those chilly nights! There is a fan distribution system to circulate the wood heat throughout the house. Wall heaters are disconnected and replaced with a new forced air furnace system. Zoning allows for mixed use and short term rentals. Lots of room off of the alley for off-street parking or an ADU. 4 bedroom, 2 bath, homes are hard to find in this area. Property appraised at $400k a year ago.